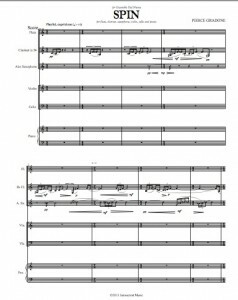 In late March 2014, my most recent piece, Spin, will be premiered by Ensemble Dal Niente at the Red Note Festival at Illinois State University in Normal, IL. 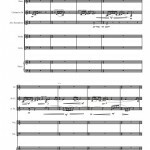 Written for Dal Niente, Spin is a short, 7-minute piece for flute, clarinet, alto sax, violin, cello and piano. Its title comes from the English language’s multiple meanings and connotations of the word “spin.” In politics, “spin doctors” are adept at twisting a story to fit their own ends; where I’m from in the South, one who “spins a great yarn” may be a great storyteller or a known exaggerator, or (as is usual) both. In music, the familiar German term fortspinnung explicitly describes the process of “spinning out” melodies at the piano; and finally, the literal spinning that results in nausea (or worse). Spin embodies these various definitions on both a temporal and spatial level. 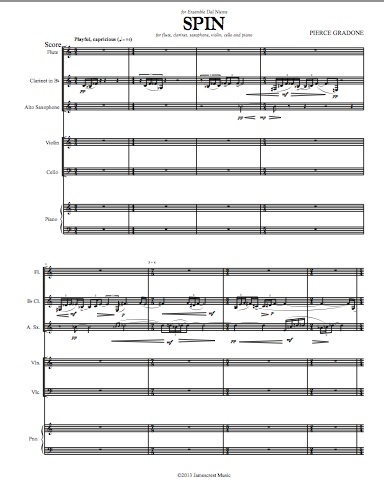 The opening clarinet solo “spins” around a recurring pitch, the material is “spun” into different guises, making it’s identity far less clear; melodies are constantly spun out and rarely return in their original state; and finally, the biggest yarn of all: I never thought once about this word while writing this piece.